Available now and exclusively online at Furniture123.co.uk, the Saphir range from Ernest Menard Meubles. The beautiful Saphir range of furniture is the first Menard range available on furniture123.co.uk. Saphir combines the elegant and traditional Louis Philippe style with the sound value of cherry wood. Add to this high quality manufacturing and a wide range of different pieces and the Saphir range offers a very diverse furniture collection for the living room, dining room and hall. 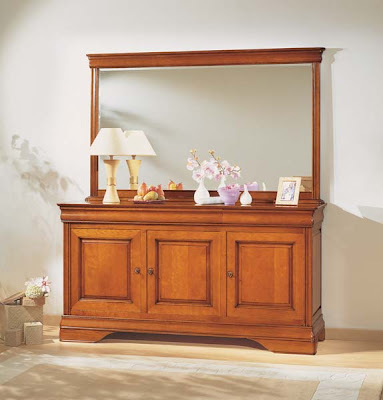 Menard design and manufacture beautiful, quality furniture and is committed to providing satisfaction. The products use a variety of materials such as oak, cherry, wenge, and walnut in solid wood and veneers, as well as contemporary materials such as metal and glass. These quality materials are combined with hand finished patinas and waxes and assembled using traditional cabinet making skills. Menard are so confident that the company provides a 10 year guarantee*. The Saphir range includes dining tables, chairs, sideboards, dressers and more, and is just a taster of what Menard furniture has to offer. Keeping checking the Furniture 123 site as more products and furniture ranges will be going online over the coming months. If there is a Menard furniture product you want but it is not on the site, click here for details on how to contact us. *Except chairs, which are covered for 1 year. Pin It Now!